I have a goal that one day, I’ll be able to hire somebody else to do all of my cooking for me. Until that day, I’m stuck making my own meals. I cook a lot of scrambled eggs, both as a result of my limited skills and also as a matter of convenience. Here’s how to get a full meal out of your eggs, complete with veggies, extra protein, and healthy fats. Add pre-chopped meat or veggies to a scramble or omelet. Salt, black pepper, and red pepper flakes go a long way. Omega-3 Eggs are worth the extra price. Studies show improvements in cardiovascular health in people that eat Omega-3 eggs as compared to conventional eggs. Scrambled eggs are easy to cook. They pick up the flavor of what they’re cooked with and are one of nature’s perfect foods. Eggs are a superfood in their own right. They provide all 16 amino acids, making them a complete protein. The yolk is the nutrient powerhouse of the egg. It contains the fat-soluble vitamins A, D, and E, as well as high concentrations of the vitamins and minerals B6, B12, calcium, folate, iron, pantothenic acid, phosphorus, thiamin, and zinc. Eggs also contain anti-oxidants. In addition, eating whole eggs rather than egg-whites has been linked to improved insulin sensitivity, as found in this study. Impaired insulin sensitivity is a hallmark feature of metabolic syndrome. Recent research has largely disproven the long-held belief that eggs are bad for you and can cause heart problems. Several studies have found that the body produces less cholesterol when eggs are consumed. Other studies have found a correlation between eating eggs and improved weight loss, decreased inflammation, and improved heart health. For a simple cook like myself, a quick scramble or omelet works best. Plain eggs get boring quickly, so here are a few of my favorite tips to keep things fresh. Step 1. Buy omega-3 eggs (in bulk). Omega-3 eggs are less expensive than they used to be, especially if you buy them at a bulk retailer such as BJ’s or Costco. I can purchase 2 dozen cage-free eggs for $3.50, for example. Each of these eggs contains 115mg of Omega-3 fatty acids. 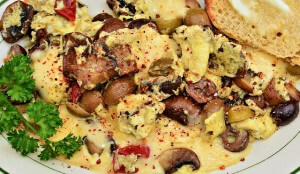 A 3 to 4 egg scramble gives me 345-460mg of Omega-3 and is an easy way to add extra healthy fat into a diet. A pinch of salt and black pepper to taste goes a long way. Red pepper flakes or cayenne pepper can add a much-needed kick. Add it into the whisked mix for best results. Step 3. Add pre-chopped meat, such as chicken or sausage, in order to add flavor and extra protein. Eggs contain 6 grams of protein per whole egg, on average. If you’re aiming for 20-40g of protein per meal, that is 3 ½ to 7 eggs at breakfast. That’s a lot of eggs! Instead, I throw in a palmful of pre-chopped meat into the eggs either as soon as they’re on the pan. The eggs will also pick up the flavor of the meat. As I mentioned here, cooking big batches of food and using it throughout the week is one of my favorite nutrition strategies. Getting vegetables in at every meal takes a bit of effort. Adding pre-chopped veggies at the same time in the cooking process as the meat adds extra flavor and gets those veggies into your diet. I prefer raw veggies for this. Often I’ll tear up broccoli florets and toss a handful into the mix. Step 5. Add a topper, such as salsa, avocado, or marinara sauce after its cooked. Salsa is one of my favorite ways to add in extra servings of vegetables. Buy it fresh from the grocery store, convince your favorite Mexican restaurant to sell you some, or make your own pico de gallo. I rotate between pico de gallo, mango, and a spicy jalapeno & cilantro-based salsa. Avocados add a second heart-healthy source of fat. Remember, Omega-3 eggs provide the first source.. And despite the weird looks that I get from my girlfriend, marinara sauce tastes great with the right egg recipe. Bonus – cooked tomatoes contain lycopenes, an antioxidant that may be beneficial for treating several diseases. Chicken, Spinach, & Broccoli Scramble: Pulled or cubed chicken, mini broccoli florets, and salsa. Wilt the spinach in the pan before adding in the eggs for best results. Kielbasa & Peppers Scramble: Kielbasa, bell peppers (raw or sauteed), and red pepper flakes. Breakfast Taco Scramble: Ground beef (sub chicken, chorizo sausage, or turkey) with MSG-free taco seasoning, jalapenos (cooked in or added as a topping), diced tomatoes (bonus points for Ro-Tel), avocado, and your choice of salsa. Classic Denver Omelet: Ham, green bell pepper, and onion topped with salsa or avocado. There are two keys to this: Add cayenne pepper for a kick. Add Mexican cheese before the eggs are done cooking, mix it in to melt, and then let it turn a golden brown before turning. With practice, the eggs will have the texture and taste of homemade macaroni and cheese – without heinous amounts of saturated fat and pasta. What are your favorite egg recipes? Share them in the comments below.